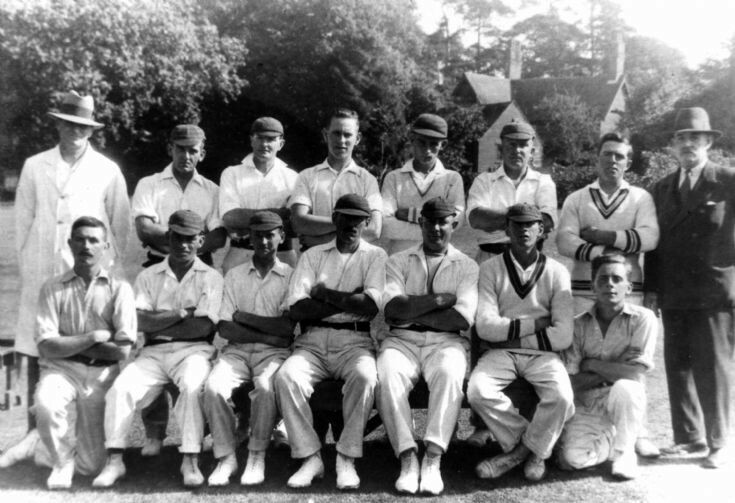 The Hyde cricket team in Handcross was one of the most photographed teams in the area, it seems. In the background is Truckers Hatch, formerly known as The Hollies (picture #752), at the junction of the southern entrance to the Hyde estate with the Horsham Road. The building nearest to the camera is actually an outbuilding in the garden, and some distance from the house. Back row: A. Bartlett (umpire), Walter Biggs, Bill Baigent, A. Beet, R. Dix, Bill Goggett, B. Miller, F. Vidler (scorer). Front row: F. Ansfield, J. Powell, William Biggs, J. Bailey, H. Sadler, T. Bailey, S Mitchell. At the time this photograph was taken, my mother, Marjorie Giraud, was going out with Alfred Ansfield (my father). Does anyone have a picture of Marjorie Giraud and perhaps with Alfred or family? Please search, I still do not have a photo of my Dad.